A dune with no avalanches during one summer, then lots of avalanches apparent underneath the carbon dioxide frost (all of the white material) in the following spring, and the same avalanches during the following summer. The scale bar is 10 meters. Image added June 19, 2012. Wind on Mars may have triggered avalanches on the Red Planet's dunes, ones 100 times larger than anything on Earth, researchers say. Traces of sand avalanches are apparent in the north polar sand sea of Mars, one of the largest sand seas in the solar system, with an estimated area of about 325,000 square miles (840,000 square kilometers), more than six times the size of the Mojave Desert in California. This evidence comes in the form of deep wedge-shaped hollows several yards across in dunes that perch above fan-shaped deposits. Presumably sand that once filled the hollows cascaded down in avalanches, leaving the deposits. New hollows show up in recent images of this sand sea every several years, indicating that these avalanchesare recurring. Some researchers suggest these sand avalanches occur when carbon dioxide frost transforms into gas in the warmth of the spring, forcing sand and rock that had been lying on top of this frozen carbon dioxide to flow down along the steep slopes of the dunes. Now, however, investigators find these massive avalanches are driven by the wind. Scientists analyzed high-resolution images from the Mars Reconnaissance Orbiter, which has been circling the Red Planet since 2006. They found that the hollows in the dunes were present at the same time as carbon dioxide frost. This means that while the dissipating frost may have caused additional sand and rock to crash downhill and enlarge the hollows, such activity was not the primary culprit behind these avalanches. Instead, the way the hollows are oriented and shaped match well with the direction of recent prevailing winds, suggesting that breezes triggered the avalanches, the researchers said. These Martian hollows are also similar in shape to smaller alcoves seen on dunes on Earth that are known to have been created by wind. 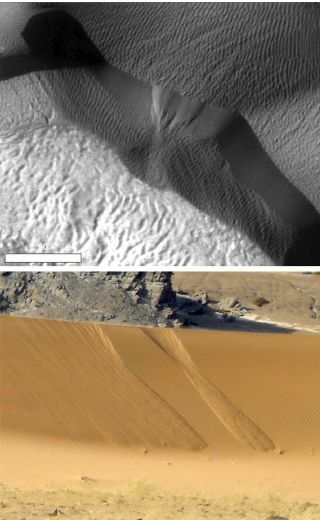 A comparison between a set of avalanches on a Martian dune and avalanches on a sand dune in Namibia. The Mars scale bar is 50 meters, indicating that the avalanches are all about 10 meters across, and the Namibia avalanches are about 30 centimeters wide, so the martian avalanches are about 30 times larger. Image added June 19, 2012. "What's unique about these features, though, is that they can be up to a scale of 100 bigger than similar avalanches on terrestrial dunes," Horgan told SPACE.com. "Some of this may be due to the idea that steep slopes are more stable under lower Martian gravity, but we also postulate that the reason that the avalanches are so large in the north polar sand sea is because of the salts that are present in that sand sea that we and others identified previously. If there's any liquid water around at all, those salts will dissolve and cement the sand grains together, creating a harder surface that can become steeper and cause bigger collapses when it does fail." Wind is known to have powerful effects on Mars. For instance, researchers recently found that most sand dunes on Mars are drifting across the Red Planetdue to the wind, revealing the planet's surface was far more active than previously imagined. The researchers are now trying to understand what these changing features of the Martian landscape "tell us about how ice, water, and wind are shaping the dunes under current climatic conditions," Horgan said. "We're also trying to understand why the sand dune avalanches we see on Mars are so much larger than the avalanches we see on Earth." Horgan and her colleague James Bell detailed their findings online May 12 in the journal Geophysical Research Letters.